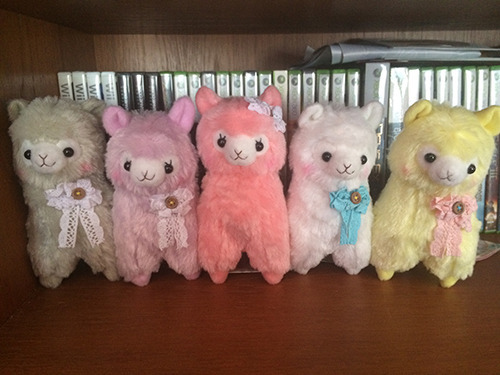 My alpacasso says shipping soon, too! 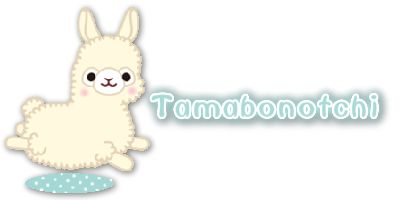 However my Wooly is apparently on backorder...hmmm...but yay, hopefully everyone that ordered from TOM gets theirs soon! Mine shipped yesterday! It's in New York, it should be where I live tomorrow! I love living on the East Coast of the US, things come so quickly. But it might be a couple of weeks before I get it, since it's being shipped to my boyfriend's mom's house and we just moved back to University. I live in the Midwest and I've gotten all my TOM packages from the group order (they keep sending it 1 item at a time.. Ugh) in 2 days. Crazy. Can't wait to see pics of these guys! 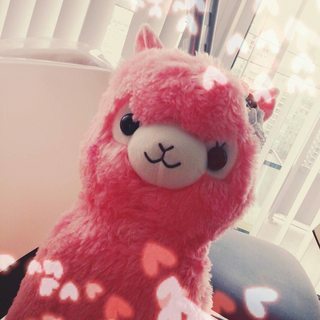 pandalpaca wrote: Mine shipped yesterday! It's in New York, it should be where I live tomorrow! I love living on the East Coast of the US, things come so quickly. But it might be a couple of weeks before I get it, since it's being shipped to my boyfriend's mom's house and we just moved back to University. My packages from TOM usually take about a week. I feel like it should be faster for me in California since I'm right across the Pacific, but what do I know about shipping? I can't wait to see everyone's photos! 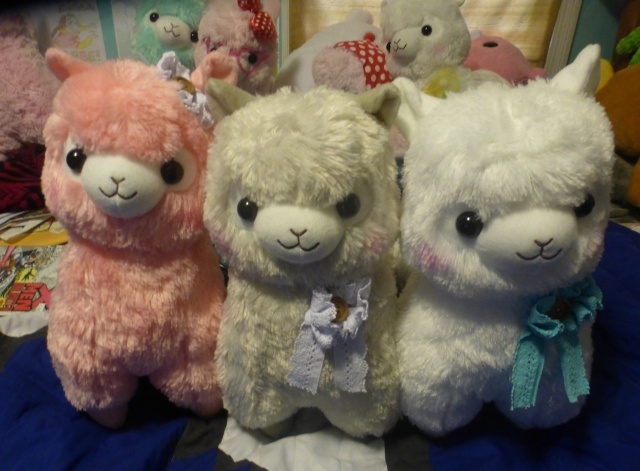 The girly alpacassos is on y!a already, and they have their own photos too. The grey really is a grey/beige! 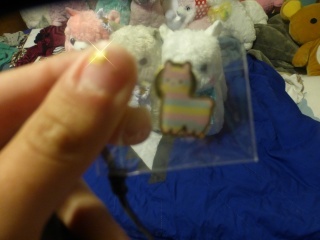 ^^ omg ugh I didn't really want one but the tag looks so cute! maybe I will get a smaller one! Mine always seem to route straight from Tokyo to JFK International and then straight to Durham (where I lived). It's super efficient and extremely quick. I also feel like it should be faster to get them to the West Coast but if the containers ship to JFK then I guess it makes sense that they take longer. It's a little strange. If you'd like I'll definitely sell my 16cm pink to you when I get it! While I've been on the fence on keeping or selling which colors, I am definitely going to sell the pink one. All three of my large girlies arrived today. 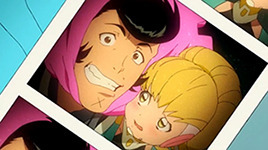 : D They are so cute! The grey is for sure a beige/grey sort of color (like an off white). Surprisingly the pink is a very hot pink, which I was pleasantly surprised by (not pastel at all). @Bsods wrote: All three of my large girlies arrived today. : D They are so cute! The grey is for sure a beige/grey sort of color (like an off white). Surprisingly the pink is a very hot pink, which I was pleasantly surprised by (not pastel at all). My ballchain set hasn't shipped yet. Gah, the large ones are freaking adorable! I'm debating on whether I should just get gray one or a few others! I really like the colours and they're relatively plain, it reminds me of the older series. Aaaah, I don't know what to do! 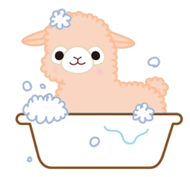 I really wish i got one now, they look so cute and fluffy. OMG i compared her to my pop'n ribbon coral and they DO look very similar in colour. I DONT REGRET ANYTHING THO! only disappointment is how small she is. she's noticeably smaller than my other 50cms..